DesignBoom - Shelter has simple storage, a makeshift washroom, a kitchen, and a sleeping area. The roof acts as a rain catcher which collects free water. 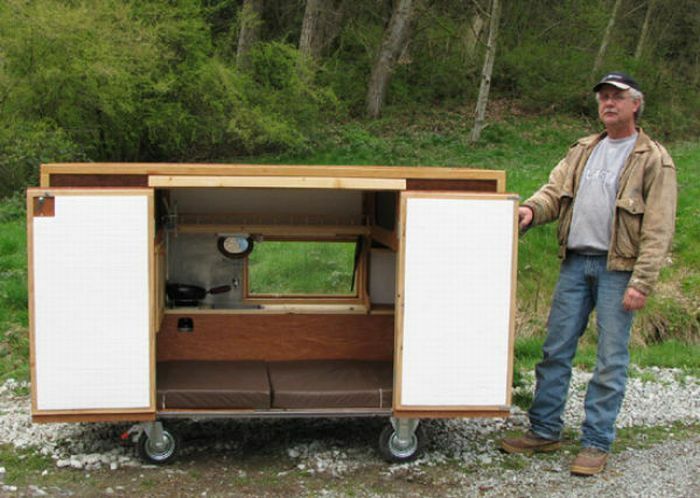 Design enthusiast, paul elkins, develops mobile units, and other small scale vehicles. burning man bicycle camper and his latest development is a mobile homeless shelter which he designed as part of a competition asking individuals to meet the demands of the rapidly growing homeless society - a kind of substitute for the grocery cart situation. elkins wanted his design construction to be a simple, light weight, water tight insulated box on wheels, built with an area for displaying and selling handmade wares.